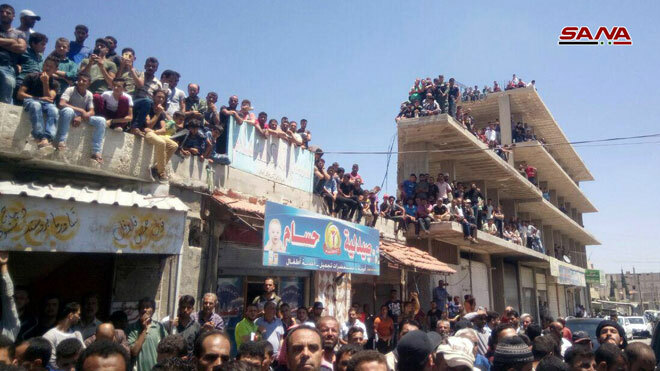 The Syrian national flag has been hoisted over Nawa city amid huge popular crowds in a step to announce the elimination of terrorist presence in the city, SANA reporter said. 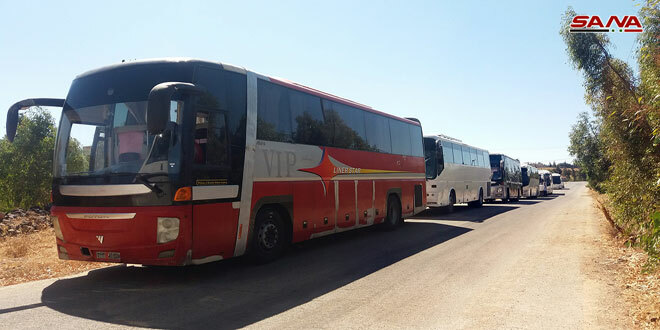 The competent authorities on Tuesday found weapons and ammunition, some of which are Israeli-made, left behind by terrorists in the towns of Babila, Yalda and Beit Sahem. 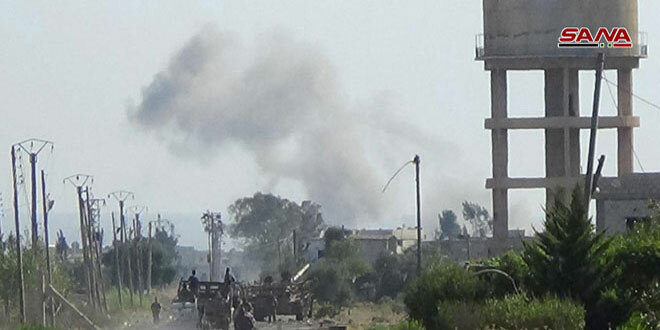 SANA reporter in southern Damascus said that while combing the towns of Babila, Yalda and Beit Sahem which have been liberated from terrorism, an engineering unit found an amount of varied ammunition, mortar shells, weapons and Israeli-made grenades, in addition to tens of explosive devices left behind by the terrorist organizations. A field commander said that the weapons included Israeli-made bombs and homemade bombs, as well as varied mortar shells and RPG launchers along with their shells. 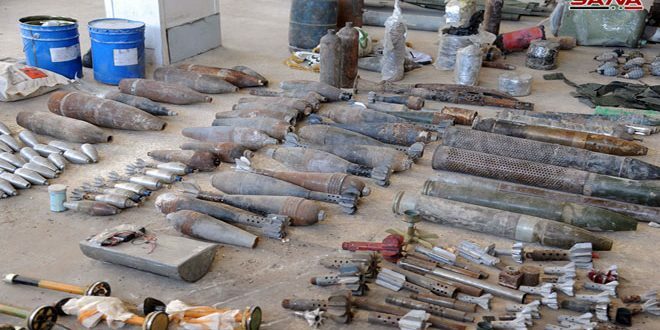 The reporter added that a number of mines were also found, in addition to explosive devices and ammunition caches, machineguns, rifles and chemical substances that are used in making explosive devices, in addition to a number of the telecommunication devices. Army units in cooperation with the competent authorities continue to comb the towns and villages to completely secure them paving the way for the return of the locals to their homes in parallel with the return of the state institutions to them after liberating them from terrorism. Syrian Arab Army liberated the villages of Koia and Beit Ara in the far northwestern part of Daraa province. 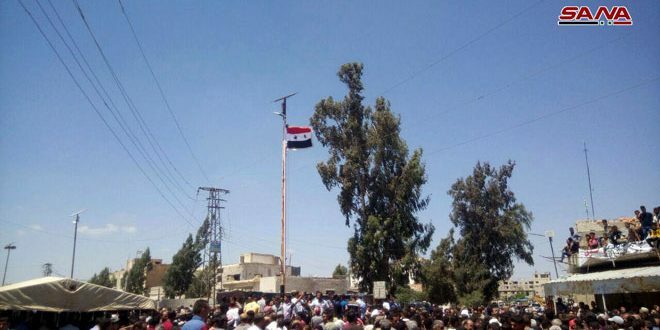 SANA’s reporter in Daraa said that army’s storming units continued their operations to liberate the rest of the villages in al-Yarmouk Basin from Daesh (ISIS) terrorists as they engaged in fierce battles with terrorists in the villages of Koia and Beit Ara which resulted in liberating the two villages and inflicting heavy losses upon terrorists’ ranks and equipment. The reporter added that army’s engineering units started sweeping the villages and enhanced army’s points in them. 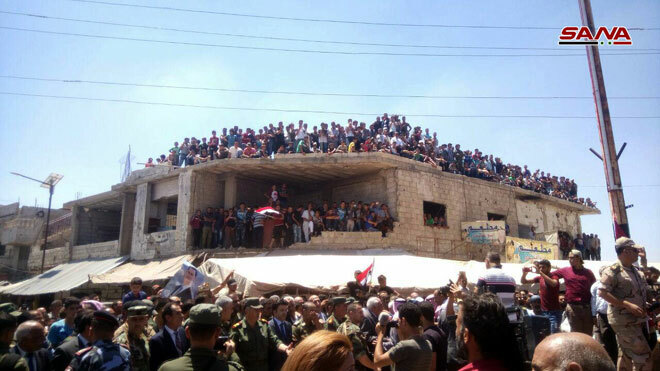 Military operations continued in al-Qseir and Maria villages to eliminate the last terrorists’ gatherings in them in order to announce the province of Daraa cleared of terrorism.